Australia’s classic three-part itinerary is a mix of the Park Hyatt Sydney, Longitude 131 with views of Uluru and Lizard Island on the Great Barrier Reef. You begin with Sydney and its iconic Opera House, its lively harbourside culture, café society and reputation for fusion cuisine. And you, of course, will be staying at the water’s edge, overlooking the Opera House. A complete contrast is provided by the outback. You’ll gain the full bush experience, staying in a tented resort within easy reach of Uluru, Kata Tjuta and the mighty Red Center. And after the dry lands, you’ll plunge into the cool blue aquatic wonderworld of the Great Barrier Reef – staying at remote Lizard Island, on the Reef itself. Look out of the window of your guest room and you’ll see the harbour. The famous Sydney Harbour Bridge will be on your left, and on your right are the distinctive sails of the Sydney Opera House. Which means that the whole of harbourside, and the best parts of this sophisticated city, are at your feet. You can criss-cross the harbour by ferry, visiting places like Manly or Darling Harbour or, alternatively, browse the fascinating streets around the Rocks area. You can experience Sydney with a half day city tour and discover the beautiful Blue Mountains and the vineyards of Hunter Valley by taking a tour beyond the city boundaries. Stay: Five nights in the Park Hyatt Sydney. Is this the high point of the triangle? Nothing quite prepares you for the sense of wonder you’ll feel when you first view the phenomenon that is Uluru or Ayer’s Rock. The surrounding red earth and uncompromising bush is pretty awesome too, and the whole experience is heightened by staying in a luxurious, African safari-style tented resort perched high on a remote sand dune with unbeatable views over the countryside and astonishing sunsets. Stay: Two nights in a luxury tent with air conditioning at Longitude 131˚. 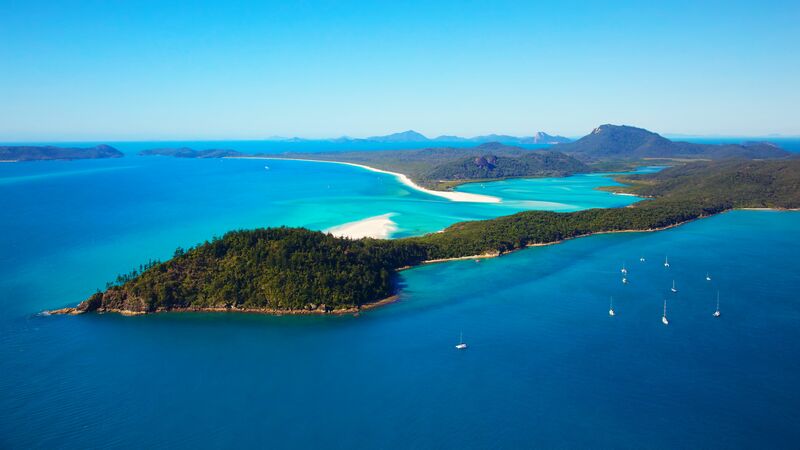 After Uluru you’ll spend a night in the far northern city of Cairns before flying over to Lizard Island and the beginning of your Great Barrier Reef adventure. Lizard Island is actually set on the Reef, so it’s the perfect base for snorkelling and diving to one of the world’s most astounding undersea sites. The renowned Cod Hole, for example, is readily accessible. You can go deep sea fishing for marlin, explore the island’s bush trails or simply find a deserted beach – there are a couple of dozen to choose from – and laze in the sun on a bed of fine white sand. Stay: Fiive nights on Lizard Island. Fly back to Cairns to connect with your flight home. Or extend your trip with one of our tailored suggestions.